Now we come to the point where it is looking like an instrument! As with any system, it takes some practice to become proficient. The jig has two bearings one on the top and the other on the bottom of the leg. These have to be in contact with the sides in order to maintain proper depth and width. The neck on this guitar is a conventional bolt on slot head so I won’t go into much detail on that as I’ve covered this on other posts. 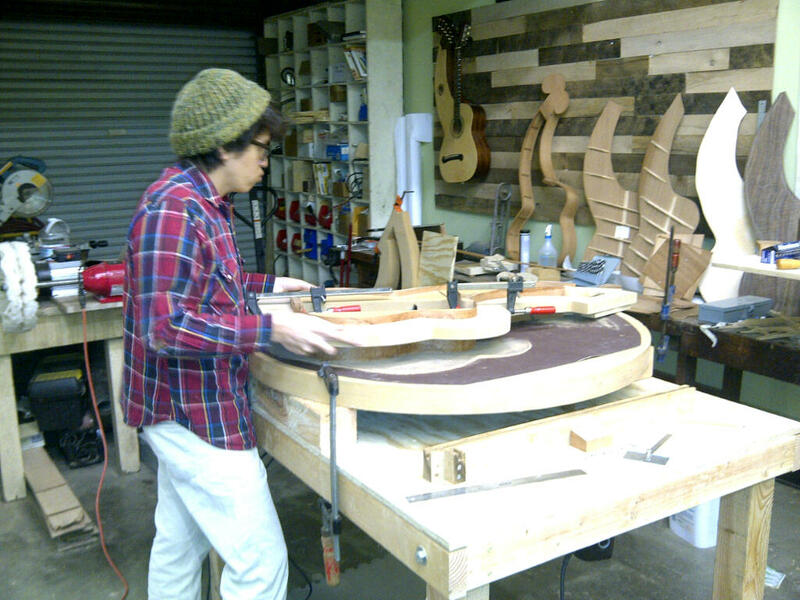 The finish, while pretty straight forward is complicated by the size of the instrument. Some creative ways of positioning it for spraying are necessary. 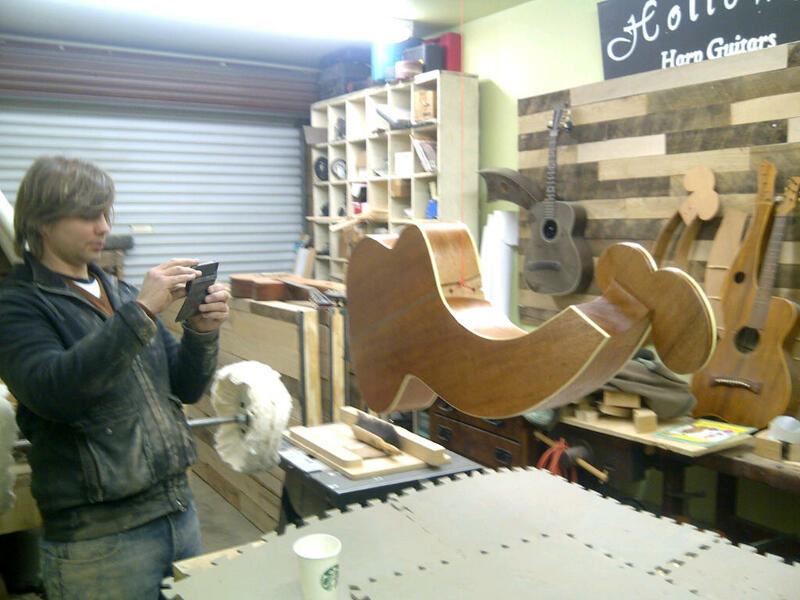 I use a length of 3/4″ pipe and attach it to a saw horse and to the body where the neck attaches. 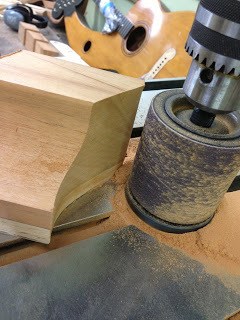 In the future, I would probable use a neck joint that would allow fretting before the installation of the neck to the body. 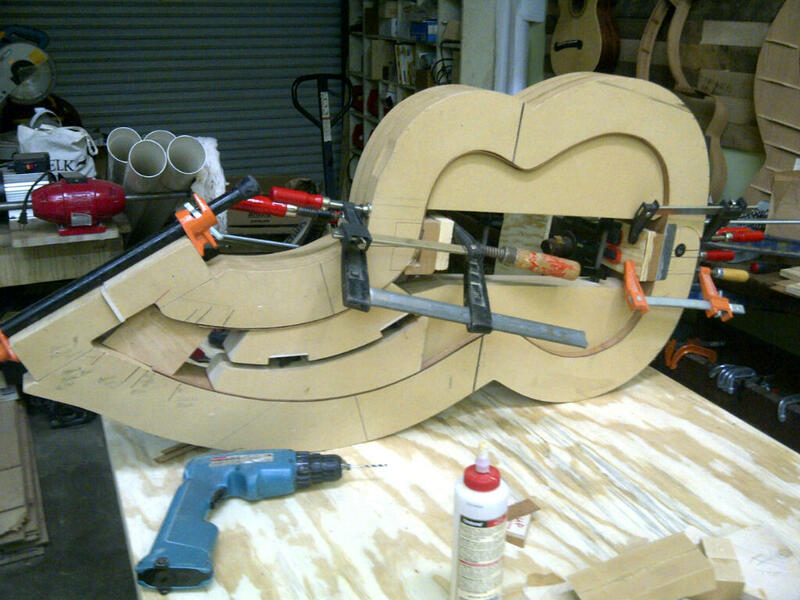 Other than the things mentioned, building a harp guitar in theory is not much different than a standard 6 string. In practice the larger scale and added strings do add to the complexity above and beyond a 6 or 12 string. Photo of Don Alder by Scott Burwell Holloway. 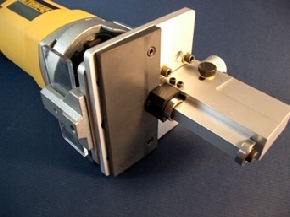 There are several ways to make rosette channels from a simple hand held trammel and chisel to a purpose built cutter. I do several a year, both for my own instruments and the classes I teach, so I use the latter from LMI. 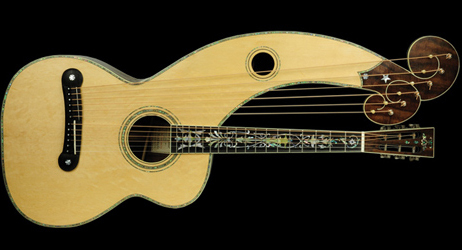 There are others available such as one from Luthier Tool. The LMI setup is kind of a pain to set up initially but once set up works very well. I’ve used several products from Luthier Tool and while expensive, they are beautifully made and easier to initially set up. 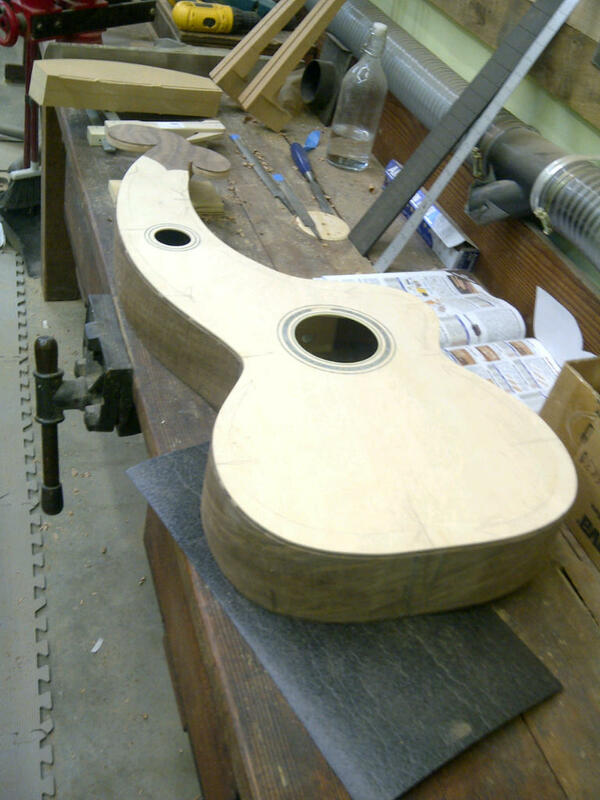 The problem is the small rosette and sound hole for the harp. It’s two inches plus and will not work with the conventional cutters. For this one I took a simple General circle cutter, re-ground the cutter to my rosette dimensions and replaced the center drill with 1/4″ drill stock with a bearing fixed to the top. 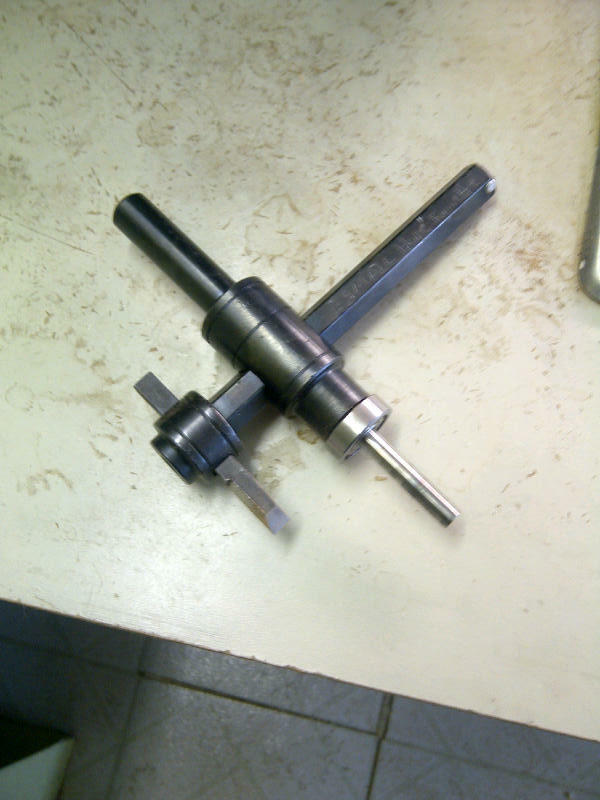 When the depth of the cutter is fixed the bearing stops it at the proper depth, much the same as the commercial cutter. Now the back and top have to be fitted. I use binding that is a full 1/4″ so that I can cut out the sides and let the main braces of both the top and back run through. I feel this makes it easier to keep everything aligned. 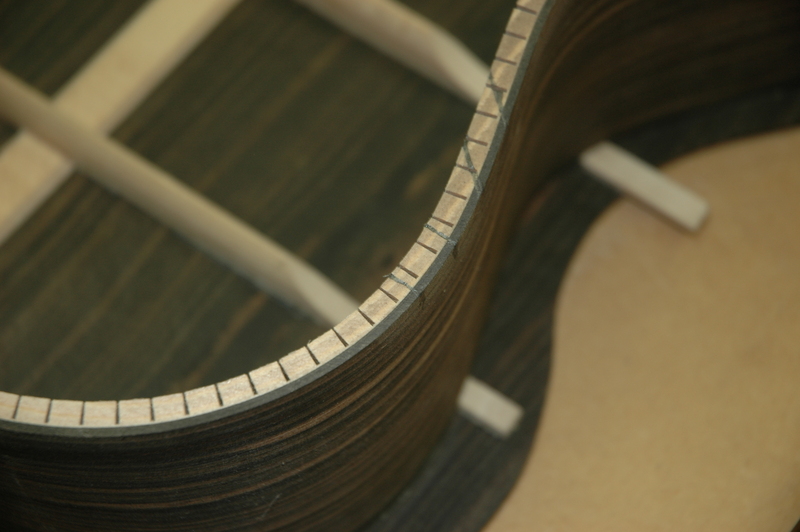 Of course, if you are doing a style of guitar without the binding like a Dyer Style 4 you have to inset the braces to the sides because there is no binding. Before I glue the top to the sides, I make sure the sides have not deformed. If they have I sand them again to the proper radius. 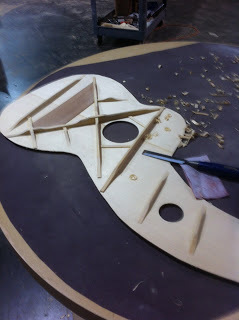 I then repeat the inletting for the top braces to the sides and glue the top on. Next time: Binding and finishing. Now it’s time for finish and assembly. The first thing is to fit the neck to the body in this case with bolts (I’ve mentioned this method in several different posts). When I’m satisfied, I make sure all of the pin holes and gaps are filled so I don’t have any sinking finish and seal and fill the grain with marine epoxy. I’ve described the finish process before so I won’t go into much more detail than to say I spray about 6 coats on the top and about 8 or 9 on the back and sides. I wet or dry sand every 2 coats and try to get the entire job done in 2 days. I let the whole thing dry for about 2 weeks and do the final compounding. I finish the neck and body separately to make the job easier. When I’m satisfied with the gloss, I put the neck on for the last time, gluing the fret board end to the body. Next, I locate the bridge and carefully glue that to the body. I then drill the bridge pin holes, taper them for bridge pins and relieve the hole with a slot for the strings. I make a saddle and nut out of bone and fit those to the bridge and neck. 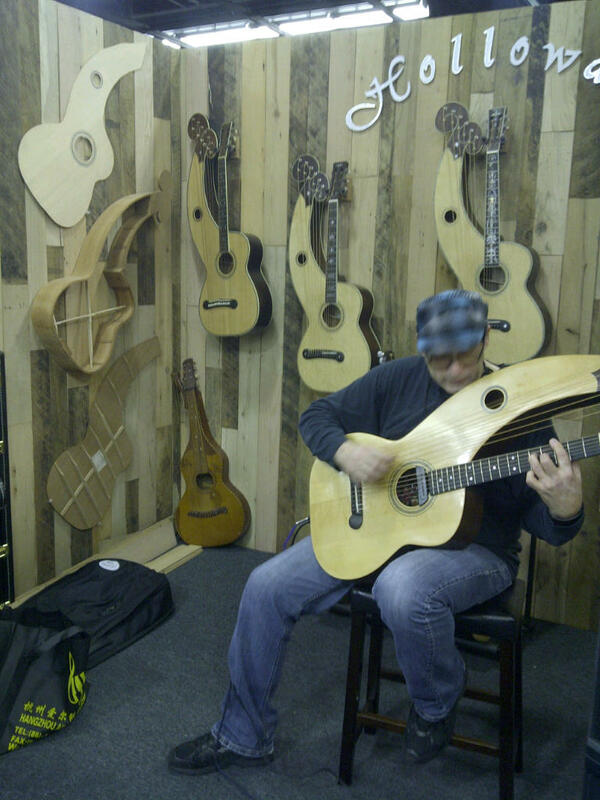 I then fret the instrument using compression fretting. 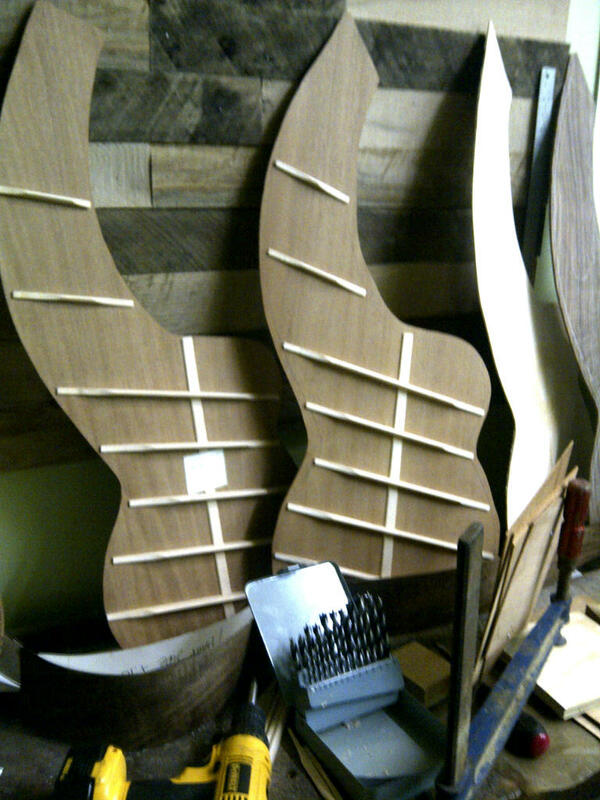 After this the frets are dressed, the tuning machines installed and the guitar is strung up for the first time. I have to say I still get a big kick out of hearing the guitar’s voice for the first time. Of course all the bugs need to be worked out and the guitar set up. And finally… the new owner plays it for the first time. Cheers, and thanks to Tim Pacheco!